Advantages: Excellent format, knowledgeable contributors, variety of subjects, inspiring artwork. Those of us that enjoy World War I aviation always look forward to this regular publication. It’s the third of six installments due for this year and as expected, a wide variety of subjects is covered. Dave Roberts leads off with another look at Fokker streaked camouflage finishes. His analysis is fascinating and the reader can’t help but gain a better understanding of the practice. The seventh chapter in George Haddow’s guide to Austro-Hungarian Naval aircraft features the Mickl-Oeffag Type H. The article centers on A11 which was made famous by the ace Gottfried Banfield. He flew 74 operational sorties in this machine, including one where he had to fly home with a shot-through control column! The plans feature focuses on the SAB C.1. Colin Owers gives us the lowdown on this unusual aircraft and supplies seven images as well as detailed 1:48 scale general arrangement drawings. “The Beast” is tackled by Francois Portier as he explains his approach to building Roden’s ambitious Staaken R.IV. The comments are complimented by step by step photos as well as an attractive colour profile by Ronny Bar. For those wanting alternate colour schemes for the new Roden BE2C, Bob Pearson steps up with three attractive proposals. His work is excellent and should inspire many modelers to try for something a little different. The usual comprehensive round up of kit reviews follows along with a similar treatment for books and accessories. This 32 page magazine continues to be an excellent resource for the early aviation aficionado. The A4 format allows for the large reproduction of photographs and also provides plenty of space for the regular plans feature. 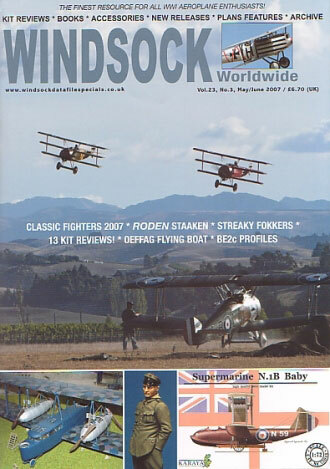 With a stable core of informed contributors, this magazine is a great resource to all modellers of First World War aircraft.